Yesterday, whilst browsing Country Girl Couture (which I found via Wardrobe Refashion) I found this post, about a little girl’s dress made from a 1950s pattern. It seemed strangely familar, so I went back to my own pattern stash, and lo and behold: the grown-up version. I find the whole mum and daughter matching thing a bit weird. 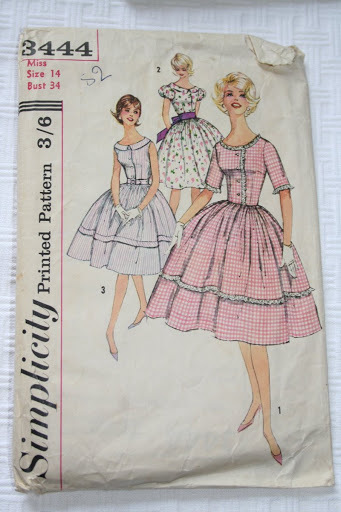 Did Simplicity also do a teen version of this pattern? Yikes. I’m glad to say my lovely mum wouldn’t have dreamed of matching clothes for us, although it may have happened accidentally in the 70s when both our wardrobes contained a LOT of brown corduroy. I’ve almost got over this trauma and almost like brown cord now. Almost. There is a school photo of my brother and I in matching brown polo-necks. Was that intentional for the photo, I wonder? Inadvertent matching might also have taken place during the c.1985 Dash purple / green jersey phase. Does anyone else remember Dash? I can’t find anything online, and I’m NOT going to dig out the family photo album. ps: The pattern above will be part of my patterns, vintage fabric, handbags and other vintage stuff sale I’ll be putting online at the end of October, partly on ebay, partly on Etsy.